Dear North America: We need to get over ourselves. Stat. Our perspective is not everyone else’s perspective. Recent travels have reminded me of this, and I’m grateful. Not everyone can travel. I know that. I’ve known what it means to not have any cash – and I’m not talking about needing to visit a bank machine, either. I admit to carrying on my shoulder the chip of those who have lived through poverty, and as much as I’d like to shrug it off there’s something that won’t let me. For now, at least. It’s that chip – the at times big, hulking boulder – that tilts my head just enough to see things from beyond the perspective of privileged middle class. Because that’s where I am, despite the shudder I feel at acknowledging it – in a place of privilege. Not as much as some, yet heads above others. I recently visited London, England and Paris, France. It was a 10-day getaway; a solo journey to remind me of who I am at my core without a prefix (Mrs.) or qualifier (woman/writer/wife/whatever). I received much advice before my trip – like where to eat and what to see. And I was cautioned about the size of things: Europe would have smaller everything, I was told. Bathrooms. Streets. Elevators. Sure, my hotel room in Paris was tiny. But compared to what? Large North American facilities, where we’ve known nothing but sprawl because we have room for it. My 5’9″ frame fit (barely) in the shower, which was added to the room well after the building was constructed hundreds of years ago – but I had more than enough space for my single being to exist. I think it might be more fitting to say that many of our consumer-culture items are bigger in North America. 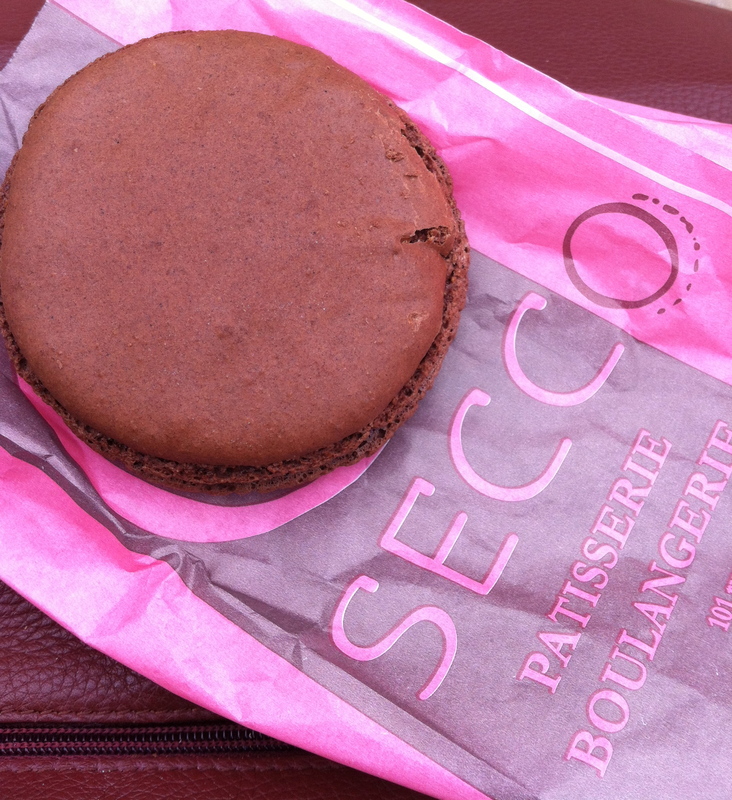 Not the macarons – I ate a delectable chocolate macaron in Paris that was the size of a giant North American hamburger (it took three sessions to consume). But many things are. From my limited new perspective I’d say we live in larger domiciles, eat bigger portions, and purchase items in larger quantities than do our European friends. I saw no 24-roll packs of toilet tissue in London – a good thing, because you’d have no place to store 24 rolls in your flat. The chip on my shoulder forms part of the horizon against which I measure experiences, and it always will. I gain new angles to my perspective with every adventure. The trick is remembering why they came to me, and honouring their contribution. So, my fellow North Americans. I ask that you please be mindful of how you approach those bigger-than or smaller-than observations. They speak of your own shoulder chips more loudly than you know. 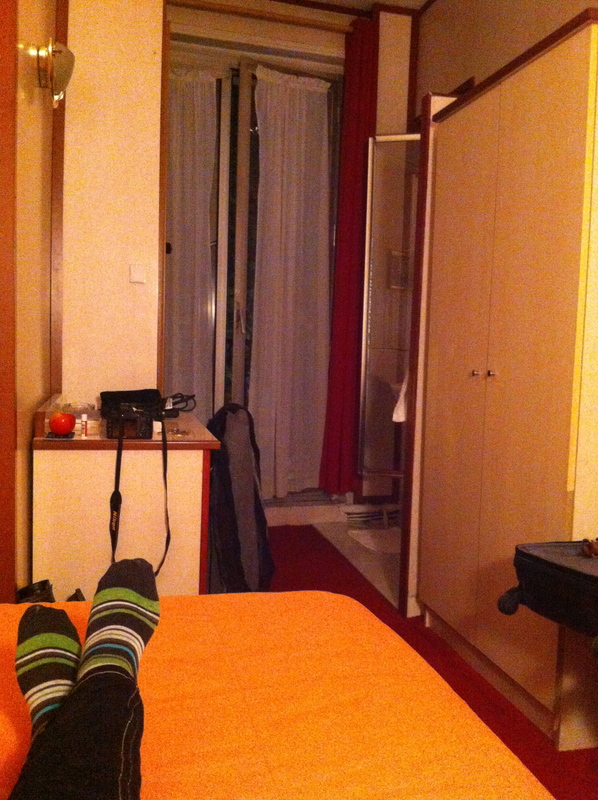 My hotel room in Paris – I loved every square inch of it. Les Pipos, 5e. 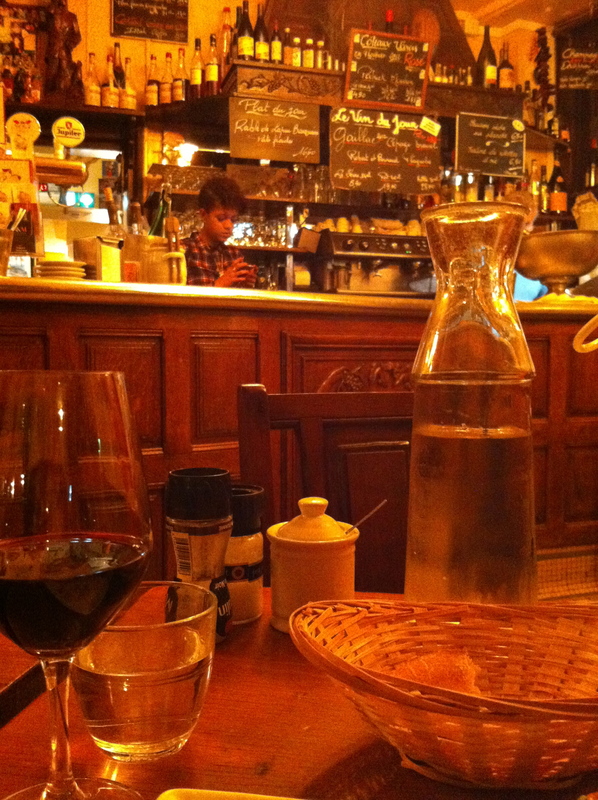 Tables were 2’x2′ square, snugged up against one another so close the server had to pull out the table to seat me. See the dark line to the left of the wine glass? That’s the gap between tables. Encouraged friendly table chat.